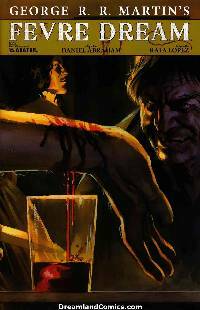 The ten-issue vampire epic on the bayou from the writer of the A Song of Ice and Fire novels continues in issue three! From the New York Times Best-selling author, George R. R. Martin, comes a tale of vampire clans, death and debauchery, legendary blood masters, and even a few epic steamboat races on the muddy Mississippi. This is Martin's FEVRE DREAM, an antebellum story of power, loss, and the fever of bloodlust. Abner is hearing strange rumors about his partner, and it's getting harder for him to defend Joshua after some of the things he's seen himself. It's one thing to have odd sleeping habits -- but to *never* leave his cabin during the day? Marsh made a promise not to push for answers... but when he goes looking, anyway, what he finds is only going to leave him with more bone-chilling questions! And the dangerous Damon Julian continues to maneuver his brood like chess pieces on a board, but what game is he really playing, and how high are the stakes? Each issue of this stunning full-color epic is illustrated by Rafa Lopez, an artist whose skilled line captures every moonlit drop of blood in delicious detail. Adapted by the Hugo-nominated author Daniel Abraham, this version of FEVRE DREAM stays faithful to Martin's original dark vision, while bringing the torture and joy of his vampires to almost-human life. This haunting series is available with Regular and Wraparound painted covers by Felipe Massafera and a very limited Nightmare retailer incentive.